Make yourself at home in Bennett Builders’ Harbour Town plan, a spec home UNDER CONSTRUCTION, with many selections still available to be made! A charming elevation is highlighted by a welcoming front porch with metal roof, decorative columns, and a mix of stone and shake siding. 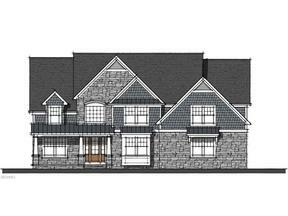 The two-story entry is flanked by the formal dining room, full bath and study, which could double as a fifth bedroom/guest suite. A spacious kitchen/dinette with large island transitions into the great room with two-story stone fireplace. Walk out the dinette to a large covered veranda to enjoy outdoor living. Custom-built cubbies/lockers greet you in the mud room. Upstairs, the master suite features a tray ceiling, adjoining sitting room, custom-tiled shower, bathtub, and two walk-in closets. Bedroom 2 has its own private bath, while Bedrooms 3 & 4 share a Jack-and-Jill bath. The second floor is completed by an upstairs laundry and a bonus loft area, overlooking the great room. Basement is finished with full bath and bonus room for exercise/crafts/toys. Currently under construction, Spring 2019 completion. Pictures for illustration only and depict recently-completed similar model.